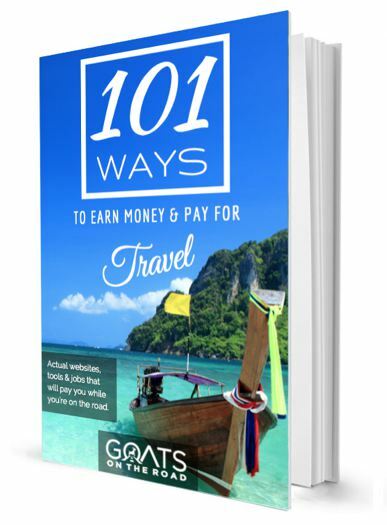 Goats on the Road Posts » Travel Blogs » Central America & The Caribbean » Mexico » 1 Tequila, 2 Tequila, 3 Tequila, Floor! When we think about Mexico, there’s one thing that definitely comes to mind…tequila! Although we’re not too keen on doing shots of the stuff, we do love having margaritas. 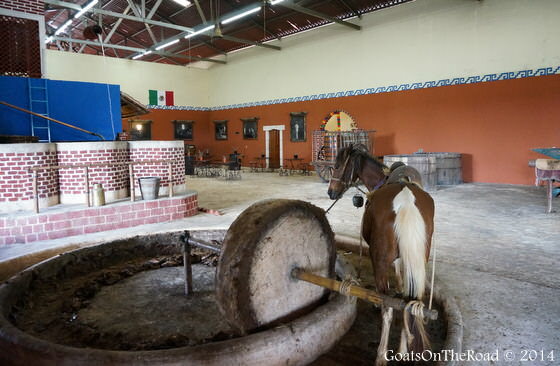 Since we’re currently travelling through the land of tequila, we figured we should check out where it comes from, how it’s made and of course, do a couple of tastings. We woke up from a wonderful sleep at the friendly Posada San Juan B&B. We spent one night here and really enjoyed ourselves. 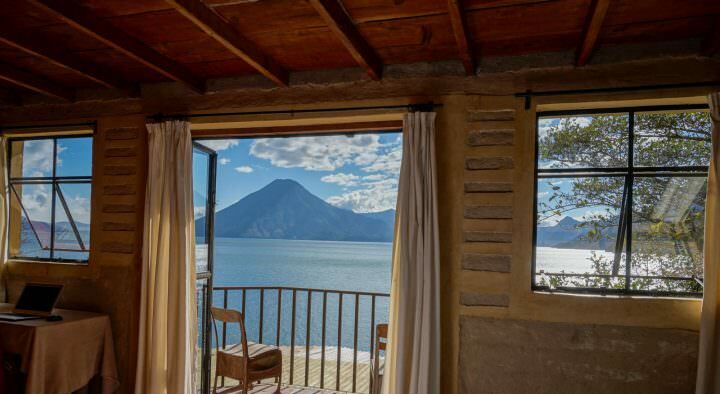 There are 4 rooms at this cozy guesthouse and ours was exceptional! The room was huge, the bed was soft and comfortable, the original beams from the home still lined our ceiling and the furniture was neatly placed around the room. The pool and common areas were quiet, peaceful and comfortable. Breakfast is included with the room and is nothing short of exceptional. We had homemade banana bread, fruit, beans and scrambled eggs with cactus and the local sausage, longaniza. These eggs were so original, we’ve never tasted anything like them! The owner, Sara, is from Mexico and is a wealth of knowledge! 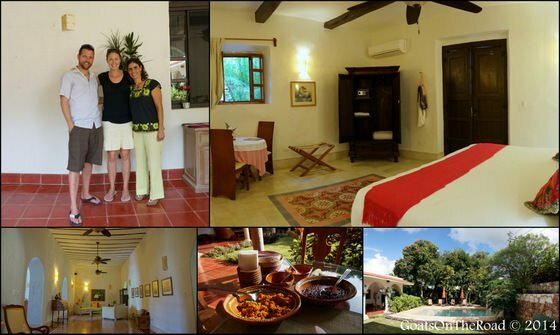 She and the other owners of the guest house are truly involved in the conservation of the Yucatan Peninsula, and are even known for exploring and discovering cenotes in the area. Pretty amazing. We had some wonderful conversations with Sara and enjoyed our stay. After just one night, we had to say goodbye…we were off to learn about tequila! We took a taxi from the center of Valladolid (40 pesos) out to the Mayapan Distillery, which is set on a beautiful acreage. As we were pulling up, we could immediately see the blue agave plants poking out of the ground. 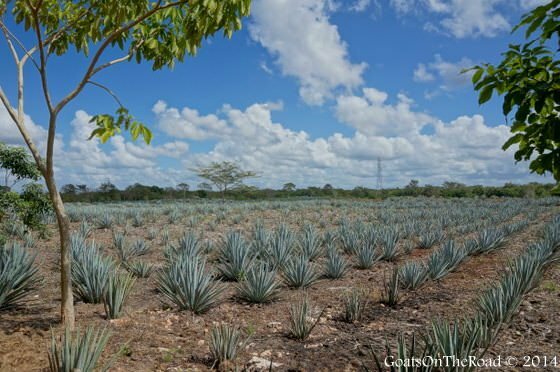 We didn’t know much about tequila, we didn’t even know that it was made from this particular plant! 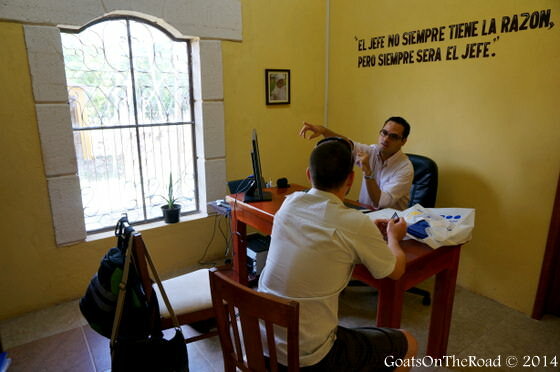 We met with the owner, Enrique, and he explained everything about tequila and his distillery. An excellent feature here is that nothing goes to waste. The fibers that are leftover from the agave plant are turned into handicrafts and are even used as the final touches on the decorating and labeling of the bottles.We also learned that it can’t technically be called “tequila” unless it’s from the state that the city of Tequila is in (Jalisco), and limited regions of 4 other states. It’s the same deal as with Champagne. 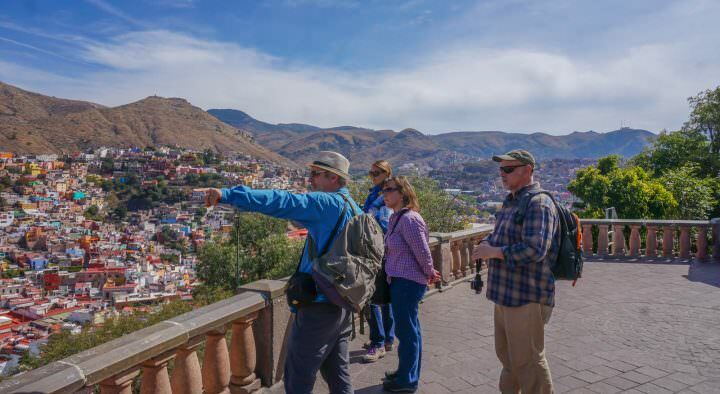 We watched and learned about each step of the tequila making process, explored the cactus museum, and sampled 4 of the distillery’s finest products! We both preferred the alcohol that was aged one year and three years. Not only is this a distillery, but there’s a ranch, an area where you can learn about different tropical fruits and if arranged ahead of time, you can do a fishing trip at the nearby lake. 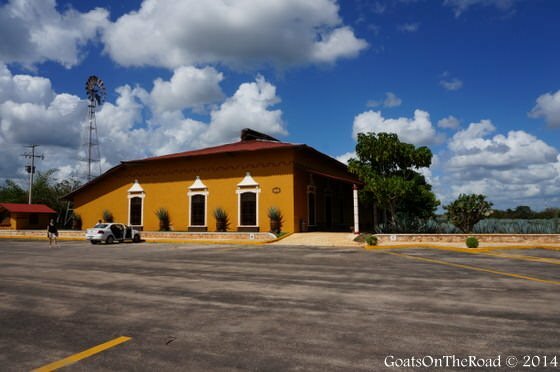 If you’re in the Yucatan, definitely make sure to check out Mayapan Distillery. 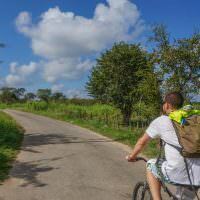 It’s a short bus trip from the Maya Riviera and is on the way to Chitzen Itza. If you’re in Valladolid, there’s no excuse for not coming here…it’s only 10 mins away. 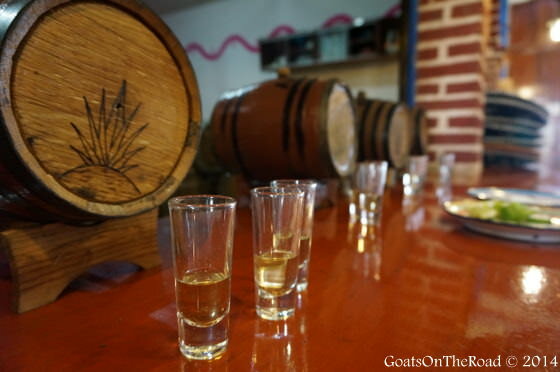 Make sure to mention that you saw Mayapan Distillery on Goats On The Road, you’ll get 25% off of the entrance fee! How Do You Prefer Your Tequila? Shots, Cocktails or On The Rocks? Share with us below! Great post guys. 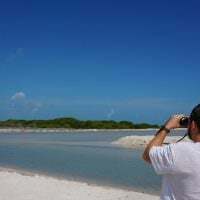 We found this place on our recent trip to the Yucatan. It popped up at us out of nowhere. It was such a great little surprise. We had a blast time exploring the way they make tequila and staff was great! Thanks for sharing! Nice! Glad you guys got to experience Mayapan as well! Such a great place, and easy to get to. Nice blog and great photos. Me, I take my tequila straight up. Outside of the tequila region in the state of Jalisco, Mexico the drink is called mezcal (more famously recognized as the liquor with the worm in the bottom of the bottle). Tequila is an appellation, like champagne vs sparkling wine. The tradition is he who finishes off the bottle of mezcal gets to eat the worm, and I’ve eaten my share, but most better class mezcals nowadays have dispensed with the worm (although you can order them fried up to golden crispness in some restaurants specializing in indigenous foods – just ask for gusanitos fritos). Other alcoholic spirits you can find around Mexico include pulque (a raw, mucilaginous brew made from the maguey plant – this one’s not for everyone), lechugilla in from Sonora (made from the desert lechugilla plant) and my favorite, sotol made in Chihuahua state from the desert spoon (or sotol) plant. Wow, thanks for all of the information! So far, we haven’t eaten the worm…not sure if I could? we haven’t tried the other alcohols you mention, but we did have Xtabentun from Valladolid…it’s sweet, but nice. 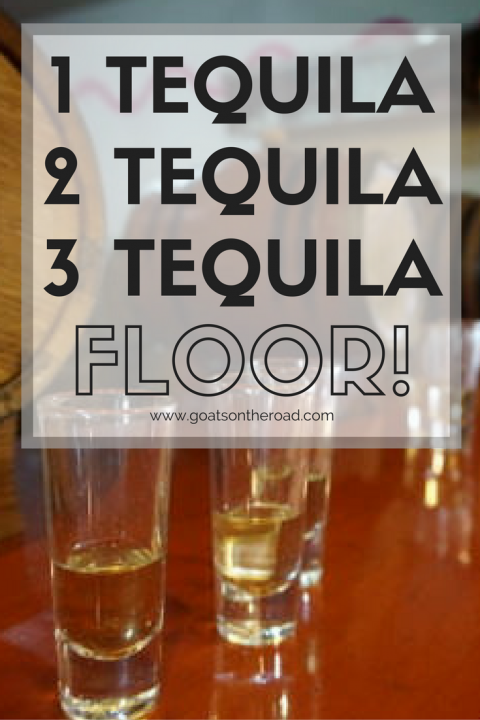 Tequila has certainly evolved – good ones are even worth drinking on their own! But we still like our tequila in fresh tamarind margaritas :-). Some are definitely “sip” worthy, that’s for sure. We still prefer ours in margaritas as well. We love fresh tamarind juice, but when we’ve ordered tamarind margaritas, it’s been a fake flavouring or something really too sweet! If it’s not from the State of Tequila or the other designated areas, then it’s just Distilled Blue Agave. Like you, we prefer our tequila in margaritas! Great job on the video! I loved watching it, listening to the music and learning about the tequila making process. I would definitely love to take the tour when we are in the area, thanks so much for sharing this informative post. What a great post! I am definitely adding this to my list of things to do when I am visiting Valladolid again this fall. It sounds like a very unique experience. 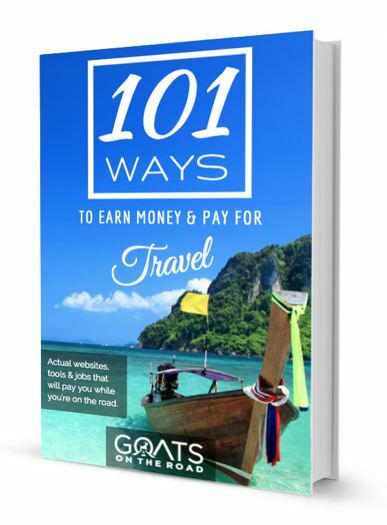 Do the tour guides speak any English? Thanks so much for sharing your experience. I will definitely be writing about mine when I return from Mexico. That’s exciting that you’re returning to Valladolid! We loved it there for sure. We took the tour with the owner and he spoke English, some of the other staff members did as well though. I’m not sure if they will still honour that discount as it was a long time ago, but you can try! Please mention us anyways to the owner if you see him 🙂 If there’s no discount, don’t worry, the entrance fee is very affordable 🙂 Cheers!